Below is a short video from Gary Richard, the founder of GPR Products and the inventor of The Cappy. He tells you everything you need to know. Hope you enjoy! It's a pretty "nifty" device. Simple, yet refined. It extends carbonation, keeps bugs out of your beverages and render cans spill proof. It's easy... just ask Neil Diamundo. With “U” side of The Cappy™ facing up, slide the leading edge under the can tab & lift to open. Then slide off of tab. With "U" side facing down, always slide The Cappy™ fully ONTO (& OFF) of the tab, from side opposite of the can opening. With The Cappy™ fully installed on the tab, rotate The Cappy™ over the can opening. Rotate back to drink. Clean prior to usage. Wow. This is a great idea for outdoor activities when bugs want to get into your soda or beer. No more worries! These can lids are awesome!! No more flat or wasted soda. Thank you very much! 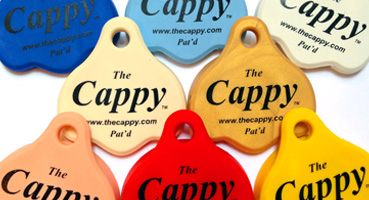 The Cappy™ is pretty easy to use and because I can put it right on my keychain, I always have it with me. I use it all the time, especially when I'm with a large group of people... as I helps me distinguish which drink is mine. Great for my kids. Stop spills and no more accidental bee stings in their mouth. Buying the Cappy in bulk packaging is a cost saver. This option offers a variety of volume choices at discounted prices. Our Blister Pack includes 4 uniquely colored Cappy’s with full, easy to understand, visual instructions.